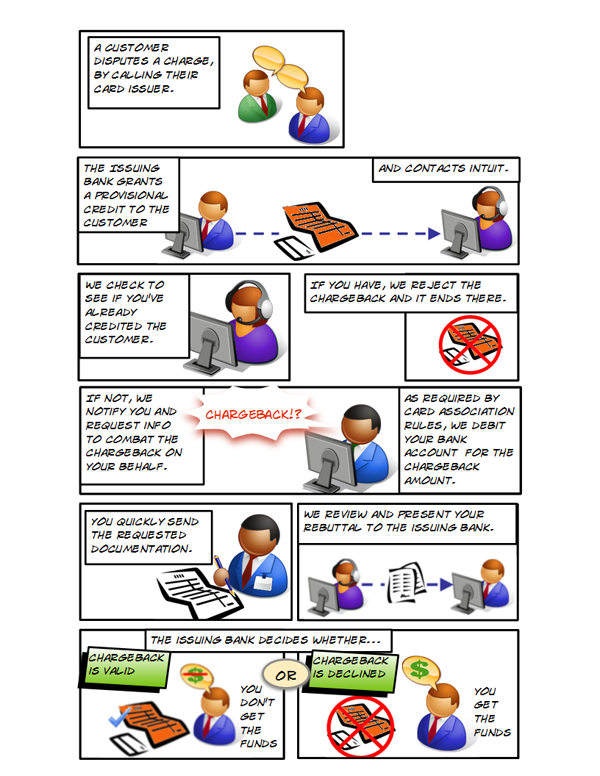 Chargeback is a transaction that has been disputed by the cardholder or card issuer. If you wish to challenge a chargeback, you must do so on time. To assist us in disputing chargebacks on your behalf, please respond promptly and file the requested paperwork by the submission deadline. The cardholder claims the transaction was canceled and/or the merchandise was returned. Being EMV (Europay MasterCard Visa) compliant is the best protection against chargebacks. EMV chip cards contain microprocessors which provide stronger transaction security features and other application capabilities. When a chip card is used, data is transferred between the chip and the issuing bank which creates unique transaction data that verifies the card's authenticity. Meanwhile, magnetic stripe cards contain unchanging data. When they are swiped, the payment processor matches them to the linked bank account by reading magnetic fields. This makes it easier for fraudsters to copy the information and create counterfeit cards. Obtain a card imprint (either manual or electronic) and the cardholder's signature for every transaction, if possible. The card imprint and the cardholder signature prove that both the physical credit card and the cardholder were present during the transaction. All non-face-to-face transactions such as mail order, telephone order, and electronic commerce transactions present a high risk of chargebacks for which there is minimal recourse available to the merchant. Use Address Verification Service (AVS) for all non-face-to-face transactions. AVS will verify that the address the customer is providing is also the billing address of the account number being used. AVS is also a requirement for all non-face-to-face transactions to obtain the best possible discount rate for the transaction. Check all security features on the credit card for face-to-face transactions including the cardholder's signature on the back panel. If the transaction involves suspicious or unusual circumstances, call the voice authorization center and request a "Code 10" authorization. Do not complete a transaction if you suspect the card is fraudulent and/or the customer is not the authorized owner of the card. Include your return/cancelation policy on the sales draft or other sales receipt signed by the cardholder. It must be on the signed receipt to be considered valid notification by MasterCard and Visa. Include any restocking and/or cancelation fees. Policies posted on Internet sites, distributed in shipment boxes, verbally delivered during telephone orders, and/or signs posted in retail locations are not considered valid notification and may be subject to a chargeback. Do not process a transaction for billing to the cardholder's account until the merchandise has been shipped and/or services have been received. You may obtain an authorization to ensure the account number is valid and funds are available. Later, when you deliver the product or service, capture those funds to complete the sale. Obtain a signed proof of delivery for merchandise that is shipped to the customer. Should a customer dispute a transaction claiming the merchandise was not received, only shipment tracers signed by the customer are considered valid evidence that a customer did indeed receive the merchandise in question. Obtain a positive authorization response for all transactions. Do not complete transactions when you get a "decline" response for a card or have not completed an authorization request. This may result in a chargeback for which you have no recourse. Capture funds within 5 days from the date a positive authorization is received. After 5 days, the authorization number is no longer valid. Do not run your personal credit card through your machine to obtain cash for yourself or any other person. This is considered fraudulent card activity and can result in the closing of your merchant account with MasterCard and Visa. Refer to your Merchant Agreement for complete information on accepting credit card transactions. If the products or services purchased are not available at the time of the transaction, inform the cardholder and obtain the cardholder’s agreement to a delayed delivery (specifying the anticipated delivery date) before proceeding with the transaction. Advise the cardholder if the products or services ordered will not be delivered within the time frame originally disclosed to and agreed to with the cardholder. The cardholder must be notified of the newly anticipated delivery time frame and given an opportunity to cancel the transaction. Contact QuickBooks Payments or Merchant Services at 888-692-9559.